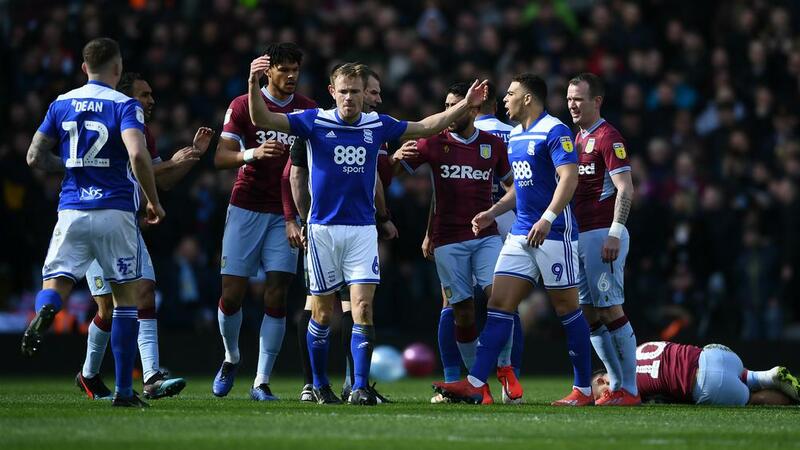 Aston Villa and Birmingham City have each been fined £5,000 by the Football Association (FA) for their skirmish in the Second City derby at St Andrew's. Players from both sides clashed after Birmingham midfielder Maikel Kieftenbeld's challenge on Jack Grealish in the early stages of the Championship encounter. The FA confirmed the punishment in a statement on Monday. It read: "Both clubs accepted a charge and the standard penalty for failing to ensure that their players conducted themselves in an orderly fashion during the fifth minute." Kieftenbeld was shown a yellow card for the tackle before a spectator ran onto the pitch and punched Villa captain Grealish. Paul Mitchell, 27, pleaded guilty to assault and was jailed for 14 weeks. Birmingham has until Friday to respond to an FA charge stemming from the attack on Grealish, who scored the only goal in the visitor's 1-0 victory.